“I was just doing the Lord’s work,” he said in one interview. 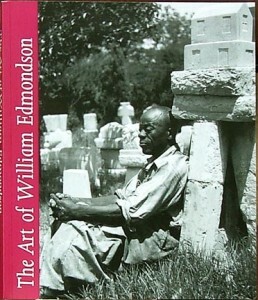 William Edmonson became the first African American artist whose work received a one-man show exhibit at MOMA. 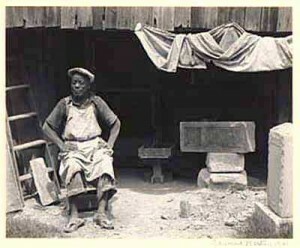 He frequently provided tombstones for members of Nashville’s Afro-American Community. Years later, his art was recognized by Sidney Hirsch, Alfred and Elizabeth Starr, and Louise Dahl-Wolfe. Dahl-Wolfe was a photographer working for Harper’s Bazaar Magazine. 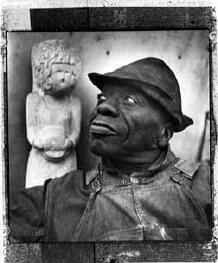 She brought Edmondson’s sculptures to the attention of Alfred Barr, who was the director of the Museum of Modern Art at New York. Interest in his art waned. Appreciation for his art was revived with the 1982 show “Black Folk Art in America, 1930-1980” at the Corcoran Gallery in Washington D.C. He never learned how to read or write. (A friend taught him to make a signature on his work). His last name was the name of the farm just outside of Nashville to which he ‘belonged.’ Edmondson was born near Nashville, Tenn., around 1870. He was in his 60’s when he began to make the limestone carvings that are so highly respected today. He claimed that God had instructed him to carve. Edmondson was born to freed slaves. He worked for the Nashville, Chattanooga and St Louis Railway for years until an accident forced him to leave the railroad. He then took a job as an orderly at an area hospital. 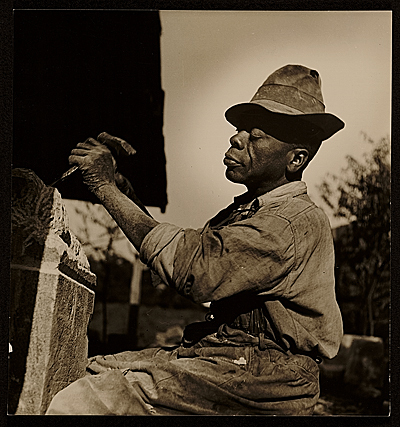 Other jobs included a stint as a stone mason’s helper.After the hospital closed in 1931, Edmondson suddenly began carving, using blocks from a load of stone that was delivered to his home by error around the same time. doves, preachers, women (including Eleanor Roosevelt, Little Orphan Annie, local brides and school teachers) and an entire menagerie of animal creatures and perceived varmints. He referred to his creations as “mirkels,” miracles that God had instructed him to create. He did not give much thought to selling his work; he quietly sold his carvings from his house along with the vegetables from his garden for a few dollars. Now they sell for six figures. Never married, he carved many figures of women and said they were all his ladies – except for a nasty-tongued former co-worker whom he carved in an exceptionally unattractive posture. Much has been made of Edmondson’s modernism. The delicacy of his work renders him both a modernist and a primitive artist at the same time, a style that evolved from within into a stunning abstract. His work was strongly linked to modernism. Edmondson’s career lasted for about fifteen years. 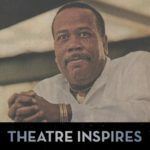 During some of these years, he worked under the Works Progress Administration, a government sponsored artists’ relief program. However, he was free to create carvings of his choice. In the 1940s, his health began to fail and he developed cancer. During the last few years of his life, he worked with small blocks of limestone. He never left Tennessee. He died on February 8, 1951 in Nashville, TN. He was buried in an unmarked grave in Mt. Ararat Cemetery in Nashville. He consistently credited God when asked about his work and never referred to himself as an artist.